Buried trampolines have become increasingly popular over the years. There are many advantages to having a trampoline buried into the ground over the typical above ground trampoline. 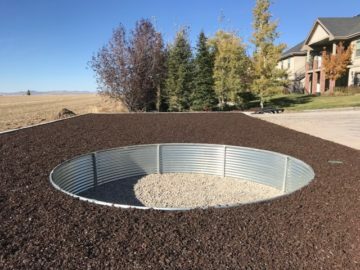 Buried trampolines are less visible than normal trampolines which means they will not take away the from the look of your yard. Buried trampolines also tend to be safer than a normal trampoline. Children can many times fall or be bounced off of a trampoline. With the trampoline already at the same level as the ground your children won’t have as far to fall. This level with the ground feature also keeps things safer for younger children that normally need help to get up to the trampoline. They can simple walk right onto the trampoline instead of having to climb a latter or require assistance every time they want to jump. Buried trampolines are also less work and better for your lawn. When a trampoline is above ground it will require moving every time you want to effectively mow the grass. Burring your trampoline allows you to just mow around the space with no hassle. We will sell just the trampoline ring if you want to install it yourself. Give Creative Design Landscaping a call today and let us take the stress and worry out of owning a trampoline.